Outside the window here in Florida, it is raining softly now. The words to the oldies song by Johnny Nash, I can see clearly now, are echoing in my head. I believe these words are a great prediction for the year 2010. I am determined to remove all obstacles (the dark clouds) from my path, and to go for the dreams deep in my heart. Walking in the light of God’s will and His word (the sunshine). Doing what God has called me to do for His glory. What about you? Are you excited about 2010? Do you see things clearly now? 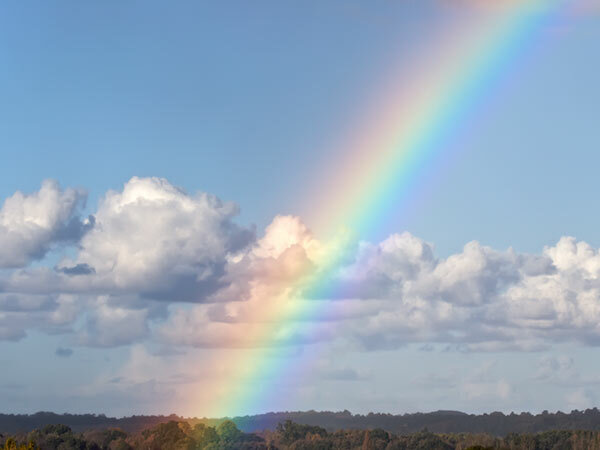 Are you ready for the promise(s) God has given you to be fulfilled this year (the rainbow)? Looking straight ahead, there’s nothing but blue skies for you and for me!